Newbridge Family Resource Centre aims to provide a wide variety of quality services within family support, community development and childcare. Please browse below to see what we offer to the communities we serve. Preparing for Life is now open to families expecting a new baby who are living in the Curragh and Newbridge areas.Mentors work alongside parents from pregnancy to when the child starts school. We visit families in their homes and give information on child development and parenting, with the aim of improving school readiness. When you join one of our mentors will visit you every month with tip sheet information and activities based around child development and parenting. 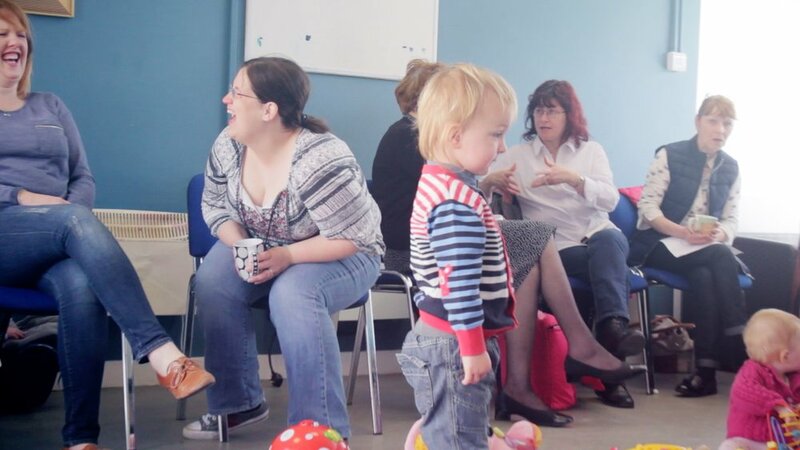 Parent, Baby and Toddler Groups can provide a stepping stone for children preparing to go to a playgroup. These groups provide children with a relaxed, friendly environment in which they are able to play independently with other children, while still having the security of their parents close by. This can be a great help in building a child’s confidence. The group offers a variety of activities such as play dough, painting and water play for the children, as well as Pediatric first Aid, Parenting Classes, plus others as the need arises. The Homework Club runs on Tuesday or Wednesday for children from third, fourth, fifth and sixth class.The club offers a safe, friendly and supportive environment for young people to develop a positive attitude towards learning and homework, as well as having fun! The Women’s Group first met at the beginning of 2012. Throughout the year the group has participated in personal development, meditation, stress relief course, learning to live a healthy life, pottery and are learning to sew and crochet. Throughout the year the group has formed a strong bond and the personal development course has cemented this bond. The Women’s Group was formed to allow women a space to meet new friends, learn new skills and to get support from each other or staff in the Centre when needed. The Golden Girls are a group of retired women who meet every Wednesday morning. The group formed eight yeasr ago, is well established and very well attended. The women take part in a variety of activities throughout the year including art, pottery, knitting crochet, chair exercises and day trips. The group was formed to ensure there is a place where older women can meet up for support and to prevent social isolation within our community. The Men's Group runs from 11 am - 1 pm each Monday (excluding Bank Holidays ) and is also open to all men who wish to get involved in tasks chosen by the group, whether it be construction of their projects, renovation of their Men's Group space (cabin) or even just to hang out to break the cycle of thinking that there's nothing for them to do on a Monday morning. We offer a quality, confidential and affordable counselling service to people living in the Newbridge area. It is not necessary to be referred by a medical practitioner, but your GP may recommend the service to you. Please contact us to enquire about the counselling services we provide. Play Therapy uses a variety of play and creative arts techniques (the 'Play Therapy Tool-Kit' to alleviate chronic, mild and moderate psychological and emotional conditions in children that are causing behavioural problems and/or are preventing children from realising their potential. Please contact us to enquire about the Play Therapy services we provide. We use evidence based parenting programmes to custom make a short parenting programme focusing on your particular issue, such as dealing with misbehaviour, conflict, bedtime routines. Learning strategies to parent assertively using prevention plans and sanction systems. The programme can run from 2 weeks– 6 weeks with one hour sessions. Learn to encourage good behaviour rather than change bad behaviour. You will learn parenting strategies to help you to solve discipline problems and to have a more enjoyable and satisfying relationship with your child. One or both parents/guardians can avail of this service. Please contact us to enquire about availability of this programme.